ABC challenge: La Femme Valiosa | Light Your Nails! Anche a me, non è il solito verde che fanno tutti! Holy holo Batman! This is gorgeous! Great color! I love the scattered holo effect! Thank you! It actually has a linear flame, too, but I just couldn't seem to capture it in my shots. Cèlo! Grazie per il consiglio, userò di sicuro la Bonder o l'Aqua Base prima di metterlo. Spero che aiutino! Magari la mia boccetta ha preso caldo poi. I lovee this - sage green but kinda gray and all sorts of pretty! That's it! Thank you Jessica! 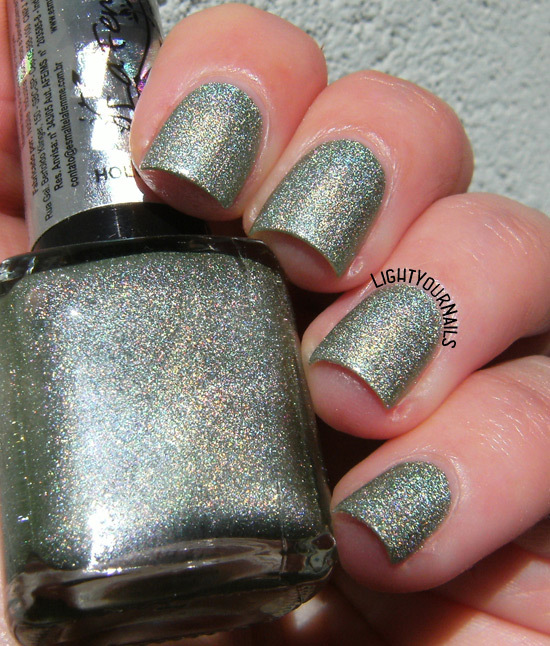 That is one stunning in-your-face holo! These types of scattered holos are always so fun. I wish we had more of them in America! I don't know that I own anything like this - it's really really pretty!